In our online home staging training program we discuss various parts of the design process, including elements like visual weight. Visual weight typically comes from not only the size of an object but also the material it is made from. Have you ever had the experience of lifting a piece of furniture only to find out it weighs much less or much more than you expected? Well, design has nothing to do with the actual weight of an object, so only in the purposes of moving the piece does this matter to us in staging. Glass coffee tables, while often much heavier in weight, typically visually weigh less than wooden coffee tables. The clear surface feels like it takes up less room than it’s dark solid counterpart. In smaller spaces, glass tables allow you to use a large surface without the room feeling tight or awkward. Imagine the photos above by Stage to Sell, a Los Angeles home staging company, with the same size table made out of wood. The room would instantly feel full of furniture. The lovely pattern of the rug would be lost, and feedback from buyers would most likely be, “the home is too small”. While in reality the tables would have been the same size, perception would have been completely different. In other homes, wooden coffee tables become an important part of the design process as their size and visual weight help to balance a space or create cohesion to other objects of the design. 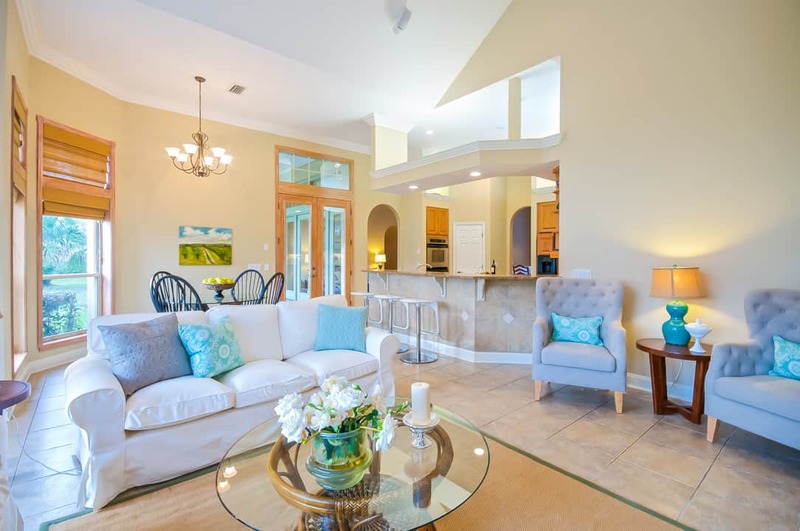 In the case of this home by Rave ReViews Home Staging, in Jacksonville, FL, the wooden coffee table helps to connect the white slipcovered sofa to the leather chairs on the other side of the room. A glass coffee table, while it would have made the room feel wider, would also have left the chairs feeling disconnected. Then again, sometimes neither wood nor glass is the right answer. FABRIC IS! In the case of fabric ottomans used as coffee tables, their visual weight may depend on not only size, but how light or dark the fabric is and whether the ottoman has a skirt and you can see under it. Check out this great use of a fabric ottoman by Fresh Perspectives our of Nashville, TN. Post by Fresh Perspectives Property Merchandising Services. When determining the right type of coffee table, you’ll need to decide on whether the room needs to appear larger or more anchored. Do you need the balance that a solid surface provides, or just the surface volume of a glass table? Understanding how visual weight impacts a space will help you make the right decision to create a beautiful space that sells! If you want to learn more, consider taking our home staging course online or in person. « Use what you have home staging. You don’t have to have new stuff. I like how you suggested glass tables feeling like they take up less space. I have been looking for a new table, but I don’t have much extra space. I can see how glass will make it seem like there is more free space than there actually is. I’ll keep this in mind while searching! This is a wonderful article! You covered so many aspects of a glass and wooden coffee tables I particularly enjoy your thorough explanation of home staging tips using these.